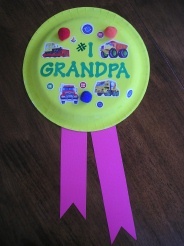 The Grandparent Award is a great craft idea for toddlers (on up), you may need to cut the 'ribbons' and write on it, but they can stick on any decorations they'd like on their special homemade gift! • Embellishments – stickers, pom poms, glitter glue, etc. 1. Paint your paper plate yellow. When it's dry, write #1 Grandparents, or Grandma/Grandpa, in the middle of the plate. Stick on your embellishements, maybe grandpa's favorite things, or grandma's favorite colors. 2. Cut ribbons out of your construction paper. They should be about 2" wide, and as long, or short as you'd like them. Glue them onto the back of your plate. If you'd like to hang your award, simply punch two holes on either side of the plate and string a piece of yarn through.